We are now a dealership for Supersplitter Company. 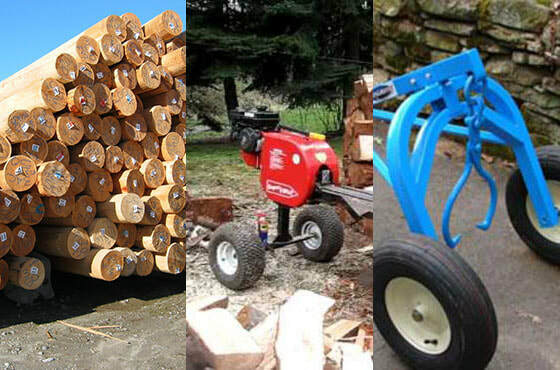 They manufacture the fastest small log splitter on the market. This wonderful machine is very well built, has almost no maintenance problems and is a pleasure to use. Most of the folks presently involved in the OWC firewood program are now using them because it dramatically increases production and allows us to split the wood in the sizes needed to make exemplary bundles. It is possible for two folks to easily split a cord an hour with the Supersplit! As a dealer we can now offer discounts to members. We believe we should pass on the benefits achieved from being a dealer to our members. 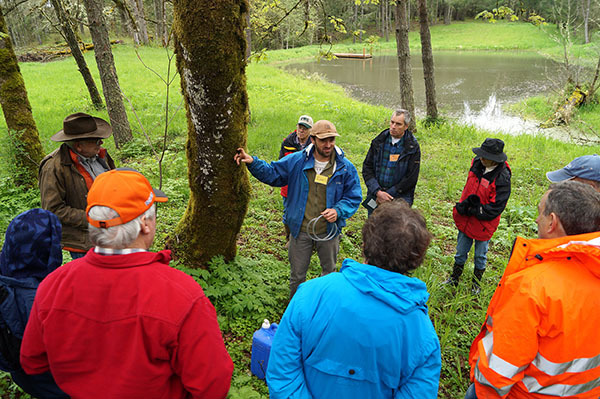 If you own forestland in Oregon, you are welcome to apply for OWC membership. Find further information here on all the SuperSplit models and options that are available to customize your machine. 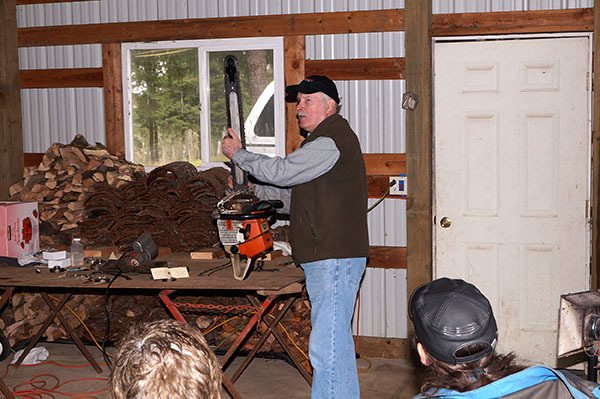 Mike Howell demonstrates the Supersplit firewood splitter. 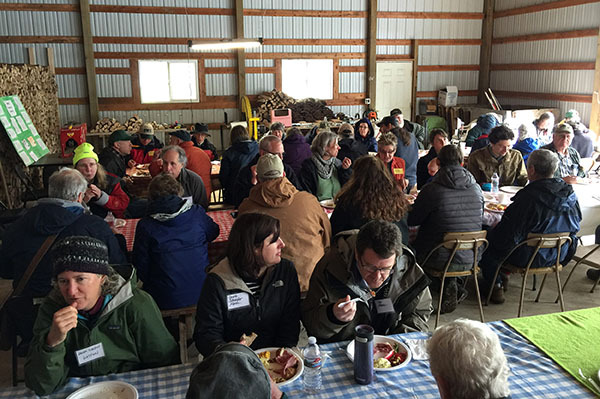 Over 50 OWC members and guests attended the 2018 Annual Meeting on April 28. Thanks to everyone who helped make it a success. Ken Nygren helped bring the group back to basics with his talk about poles and piling. Mark Havel accomplished his usual super presentation on low impact logging using the arches and demonstrating good chainsaw technique. I think many who were there were very impressed. 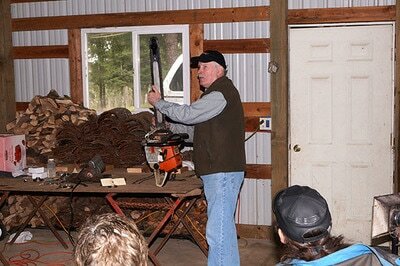 Mike Howell did an excellent job demonstrating the Supersplit machine and explaining the techniques of making our high quality firewood bundle. Thanks to Lynn and Barb who did a great job in presenting the financials during our business meeting. Greg Wildhaber and wife Caroline blew us away with the wonderful flavors and delicious pork roast. Neil is stepping down as President this year and was recognized for his many years of service to OWC. He and Ardis were most appreciative of the beautiful engraved wood gifts. The Myrtlewood Pie display piece is spectacular and the Rosewood pen set is most appreciated. Thank you all again for the great meeting and all of the work you did to get things done in time and cleaned up afterward. All OWC members and their families are invited to attend the 2018 Annual Meeting on April 28. Starting at 9:00 am, there will be a brief business meeting. President Neil Schroeder will report on the state of the Co-op, and members will vote on proposed Bylaws amendments and to elect new officers. Ken Nygren, a consulting forester and partner with White Oak Natural Resource Service near Hillsboro, will talk about the high-value utility pole market. Working with Bell Timber as the buyer, Ken will describe how landowners can manage select stands for poles. Large diameter Douglas fir and western redcedar poles sourced from the Northwest command top dollar and have no competition in the rest of the US. OWC is now the local distributor for the SuperSplit log splitter, a high-speed kinetic machine that out-performs hydraulic splitters. Our distribution agreement means that OWC can now offer a substantial discount on the most popular machines to its members. There will be demonstration set up to show the SuperSpit in action. Details on discount pricing and ordering will be provided. OWC is also now a dealer for LogRite Tools. LogRite makes a wide variety of tools and equipment useful for working in the woods, including log arches, cant hooks, peaveys, axes, etc. Again, OWC will be able to pass along savings to its members. Some of the products will be on display, along with discount pricing and ordering info. We will share a potluck lunch, so please bring a generous salad, side dish or dessert. The main dish will be a delicious pork barbecue prepared by Greg Wildhaber. During the months of November and December, Co-op members harvest boughs from native evergreen trees growing on their tree farms. We sell these to florists in Portland and Salem who use them to make centerpieces and table decorations for the holidays. We also sell to folks making wreaths and garlands. This year, nine OWC families are involved in producing boughs from a variety of species, including Noble fir, Grand fir, Incense cedar, Port Orford cedar, Ponderosa pine and Western while pine. We wait to harvest until shortly before delivery to the customer so our greens are fresh and fragrant. Although most of OWC’s bough business is wholesale, anyone can purchase our evergreens for home decoration. Through the Co-op’s sister company, Oregon Heartwood, we sell locally to order and can ship anywhere in the country. To order our holiday greens, please visit OregonHeartwood.com/boughs. 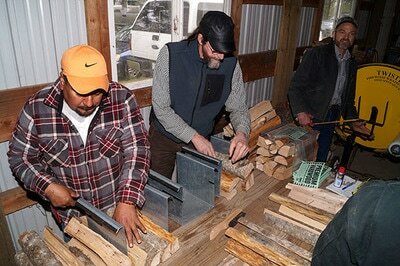 Woodfirst Sustainable Enterprises, based in Klamath Falls, OR, provides mobile saw milling services throughout Oregon. 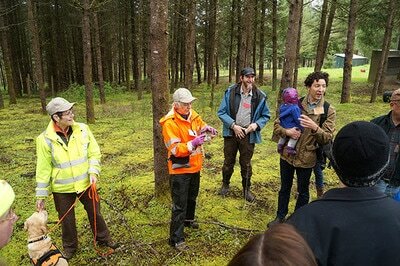 The company is a Working Partner for the Oregon Woodland Co-op. Chris Johnson, Woodfirst owner has 35 years of sawmilling experience. He has offered to donate to OWC 10% of the gross proceeds from any jobs performed for or referred by Co-op members. 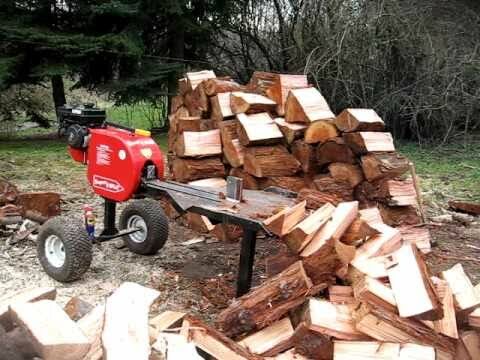 Two portable sawmills are available to turn logs into lumber. The Woodmizer LT40 can take up to a 36 inch diameter x 20 ft long log, and can produce planks up to 20 inches wide. 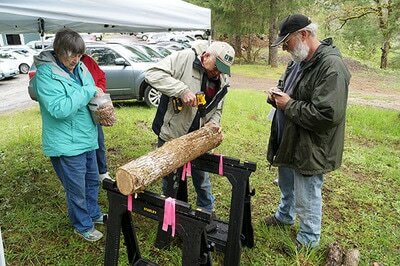 The Alaskan-style chainsaw mill can cut slabs up to 38 inches wide, e.g. for live-edge table tops. To maximize production efficiency, a landowner should have one or two laborers for offloading lumber, depending on the size of the logs. It’s recommended to have a forklift, tractor. or backhoe with a thumb for lifting and moving logs to the sawmill once it is set up and level. With supplemental labor and equipment provided by landowner, Chris can produce 350 to 500 board feet of lumber per hour. For details and pricing, contact Chris by phone 541-892-0323, or email woodfirstmilling@yahoo.com.